For a long time now, scientists were held in thrall by publishers. They worked voluntarily – without getting any pay – as editors and reviewers for the publishers, and they allowed their research to be published in scientific journals without receiving anything out of it. No wonder that scientific publishing had been considered a lucrative business. Well, that’s no longer the case. Now, scientific publishers are struggling to maintain their stranglehold over scientists. If they succeed, science and the pace of progress will take a hit. Luckily, the entire scientific landscape is turning on them – but a little support from the public will go a long way in ensuring the eventual downfall of an institute that is no longer relevant or useful for society. To understand why things are changing, we need to look back in history to 1665, when the British Royal Society began publishing research results in a journal form called Philosophical Transactions of the Royal Society. Since the number of pages available in each issue was limited, the editors could only pick the most interesting and credible papers to appear in the journal. As a result, scientists from all over Britain fought to have their research published in the journal, and any scientist whose research was published in an issue gained immediate recognition throughout Britain. Scientists were even willing to become editors for scientific journals, since that was a position that demanded request – and provided them power to push their views and agendas in science. Thus was the deal struck between scientific publishers and scientists: the journals provided a platform for the scientists to present their research, and the scientists fought tooth and nail to have their papers accepted into the journals – often paying from their pockets for it to happen. The journals publishers then had full copyrights over the papers, to ensure that the same paper would not be published in a competing journal. That, at least, was the old way for publishing scientific research. The reason that the journal publishers were so successful in the 20th century was that they acted as aggregators and selectors of knowledge. They employed the best scientists in the world as editors (almost always for free) to select the best papers, and they aggregated together all the necessary publishing processes in one place. And then the internet appeared, along with a host of other automated processes that let every scientist publish and disseminate a new paper with minimal effort. Suddenly, publishing a new scientific paper and making the scientific community aware of it, could have a radical new price tag: it could be completely free. The scientist sends the paper to the journal: Can now be conducted easily through the internet, with no cost for mail delivery. The paper is rerouted to the editor dealing with the paper’s topic: This is done automatically, since the authors specify certain keywords which make sure the right editor gets the paper automatically to her e-mail. Since the editor is actually a scientist volunteering to do the work for the publisher, there’s no cost attached anyway. Neither is there need for a human secretary to spend time and effort on cataloguing papers and sending them to editors manually. The editor sends the paper to specific scientific reviewers: All the reviewers are working for free, so the publishers don’t spend any money there either. Paginate, proofread, typeset, and ensure the use of proper graphics in the paper: These tasks are now performed nearly automatically using word processing programs, and are usually handled by the original authors of the paper. Print and distribute the journal: This is the only step that costs actual money by necessity, since it is performed in the physical world, and atoms are notoriously more expensive than bits. But do we even need this step anymore? I have been walking around in the corridors of the academy for more than ten years, and I’ve yet to see a scientist with his nose buried in a printed journal. Instead, scientists are reading the papers on their computer screens, or printing them in their offices. The mass-printed version is almost completely redundant. There is simply no need for it. In conclusion, it’s easy to see that while the publishers served an important role in science a few decades ago, they are just not necessary today. The above steps can easily be conducted by community-managed sites like Arxive, and even the selection process of high quality papers can be performed today by the scientist themselves, in forums like Faculty of 1000. The publishers have become redundant. But worse than that: they are damaging the progress of science and technology. In a few years from now, the producers of knowledge will not be human scientists but computer programs and algorithms. Programs like IBM’s Watson will skim through hundreds of thousands of research papers and derive new meanings and insights from them. This would be an entirely new field of scientific research: retrospective research. Computerized retrospective research is happening right now. A new model in developmental biology, for example, was discovered by an artificial intelligence engine that went over just 16 experiments published in the past. Imagine what would happen when AI algorithms cross and match together thousands papers from different disciplines, and come up with new theories and models that are supported by the research of thousands of scientists from the past! For that to happen, however, the programs need to be able to go over the vast number of research papers out there, most of which are copyrighted, and held in the hands of the publishers. You may say this is not a real problem. After all, IBM and other large data companies can easily cover the millions of dollars which the publishers will demand annually for access to the scientific content. What will the academic researchers do, though? Many of them do not enjoy the backing of the big industry, and will not have access to scientific data from the past. Even top academic institutes like Harvard University find themselves hard-pressed to cover the annual costs demanded by the publishers for accessing papers from the past. Many ventures for using this data are based on the assumption that information is essentially free. We know that Google is wary of uploading scanned books from the last few decades, even if these books are no longer in circulation. Google doesn’t want to be sued by the copyrights holders – and thus is waiting for the copyrights to expire before it uploads the entire book – and lets the public enjoy it for free. So many free projects could be conducted to derive scientific insights from literally millions of research papers from the past. Are we really going to wait for nearly a hundred years before we can use all that knowledge? Knowledge, I should mention, that was gathered by scientists funded by the public – and should thus remain in the hands of the public. Scientific publishers are slowly dying, while free publication and open access to papers are becoming the norm. The process of transition, though, is going to take a long time still, and provides no easy and immediate solution for all those millions of research papers from the last century. What can we do about them? Here’s one proposal. It’s radical, but it highlights one possible way of action: have the government, or an international coalition of governments, purchase the copyrights for all copyrighted scientific papers, and open them to the public. The venture will cost a few billion dollars, true, but it will only have to occur once for the entire scientific publishing field to change its face. It will set to right the ancient wrong of hiding research under paywalls. That wrong was necessary in the past when we needed the publishers, but now there is simply no justification for it. Most importantly, this move will mean that science can accelerate its pace by easily relying on the roots cultivated by past generations of scientists. If governments don’t do that, the public will. Already we see the rise of websites like Sci-Hub, which provide free (i.e. pirated) access to more than 47 million research papers. Having been persecuted by both the publishers and the government, Sci-Hub has just recently been forced to move to the Darknet, which is the dark and anonymous section of the internet. Scientists who will want to browse through past research results – that were almost entirely paid for by the public – will thus have to move over to the Darknet, which is where weapon smugglers, pedophiles and drug dealers lurk today. That’s a sad turn of events that should make you think. Just be careful not to sell your thoughts to the scholarly publishers, or they may never see the light of day. Dr Roey Tzezana is a senior analyst at Wikistrat, an academic manager of foresight courses at Tel Aviv University, blogger at Curating The Future, the director of the Simpolitix project for political forecasting, and founder of TeleBuddy. When I first read about the invention of the Right Cup, it seemed to me like magic. You fill the cup with water, raise it to your mouth to take a sip – and immediately discover that the water has turned into orange juice. At least, that’s what your senses tell you, and the Isaac Lavi, Right Cup’s inventor, seems to be a master at fooling the senses. Lavi got the idea for the Right Cup some years ago, when he was diagnoses with diabetes at the age of 30. His new condition meant that he had to let go of all sugary beverages, and was forced to drink only plain water. As an expert in the field of scent marketing, however, Lavi thought up of a new solution to the problem: adding scent molecules to the cup itself, which will trick your nose and brain into thinking that you’re actually drinking fruit-flavored water instead of plain water. This new invention can now be purchased on Indiegogo, and hopefully it even works. The Right Cup – fooling you into thinking that plain water tastes like fruit. What does the Right Cup mean for the future? First and foremost, the Right Cup is one result of all the massive investments in nano-technology research made in the last fifteen years. “Between 2001 and 2013, the U.S. federal government funneled nearly $18 billion into nanotechnology research… [and] The Obama administration requested an additional $1.7 billion for 2014.” Writes Martin Ford in his 2015 book Rise of the Robots. These billions of dollars produced, among other results, new understandings about the release of micro- and nano-particles from polymers, and the ways in which molecules in general react with the receptors in our noses. In short, they enabled the creation of the Right Cup. There’s a good lesson to be learned here. When our leaders justified their investments in nano-technology, they talked to us about the eradication of cancer via drug delivery mechanisms, or about bridges held by cobwebs of carbon nanotubes. Some of these ideas will be fulfilled, for sure, but before that happens we might all find ourselves enjoying the more mundane benefits of drinking Illusory orange-flavored water. We can never tell exactly where the future will lead us: we can invest in the technology, but eventually innovators and entrepreneurs will take those innovations and put them to unexpected uses. All the same, if I had to guess I would imagine many other uses for similar ‘Right Cups’. Kids in Africa could use cups or even straws which deliver tastes, smells and even more importantly – therapeutics – directly to their lungs. Consider, for example, a ‘vaccination cup’ that delivers certain antigens to the lungs and thereby creates an immune reaction that could last for years. This idea brings back to mind the Lucky Iron Fish we discussed in a previous post, and shows how small inventions like this one can make a big difference in people’s lives and health. It is already clear that we are rushing headlong into a future of rapid manufacturing, in which people can enjoy services and production processes in their households that were reserved for large factories and offices in the past. We can all make copies of documents today with our printer/scanner instead of going to the store, and can print pictures instead of waiting for them to be developed at a specialized venue. In short, technology is helping us be more geographically self-reliant – we don’t have to travel anymore to enjoy many services, as long as we are connected to the digital world through the internet. The internet provides information, and end-user devices produce the physical result. This trend will only progress further as 3D printers become more widespread in households. The Right Cup is another example for a future of self-reliance. Instead of going to the supermarket and purchasing orange juice, you can buy the cup just once and it will provide you with flavored water for the next 6-9 months. But why stop here? Take the Right Cup of a few years ahead and connect it to the internet, and you have the new big product: a programmable cup. This cup will have a cartridge of dozens of scent molecules, each of which can be released at different paces, and in combination with the other scents. You don’t like orange-flavored water? No problem. Just connect the cup to the World Wide Web and download the new set of instructions that will cause the cup to release a different combination of scents so that your water now tastes like cinnamon flavored apple cider, or any other combinations of tastes you can think of – including some that don’t exist today. As with any innovation and product proposed on crowdfunding platforms, it’s difficult to know whether the Right Cup will stand up to its hype. As of now the project has received more than $100,000 – more than 200% of the goal they put up. Should the Right Cup prove itself taste-wise, it could become an alternative to many light beverages – particularly if it’s cheap and long-lasting enough. Personally, I don’t see Coca-Cola, Pepsi and orchard owners going into panic anytime soon, and neither does Lavi, who believes that the beverage industry is “much too large and has too many advertising resources for us to compete with them in the initial stages.” All the same, if the stars align just right, our children may opt to drink from their Right Cups instead of buying a bottle of orange juice at the cafeteria. Then we’ll see some panicked executives scrambling around at those beverages giants. It’s still early to divine the full impact the Right Cup could have on our lives, or even whether the product is even working as well as promised. For now, we would do well to focus only on previously identified mega-trends which the product fulfills: the idea of using nano-technology to remake everyday products and imbue them with added properties, and the principle of self-reliance. In the next decade we will see more and more products based on these principles. I daresay that our children are going to be living in a pretty exciting world. Disclaimer: I received no monetary or product compensation for writing this post. I often imagine myself meeting James Clark Maxwell, one of the greatest physicists in the history of the Earth, and the one indirectly responsible for almost all the machinery we’re using today – from radio to television sets and even power plants. He was recognized as a genius in his own time, and became a professor at the age of 25 years old. His research resulted in Maxwell’s Equations, which describe the connection between electric and magnetic fields. Every electronic device in existence today, and practically all the power stations transmitting electricity to billions of souls worldwide – they all owe their existence to Maxwell’s genius. And yet when I approach that towering intellectual of the 19th century in my imagination, and try to tell him about all that has transpired in the 20th century, I find that he does not believe me. That is quite unseemly of him, seeing as he is a figment of my imagination, but when I devote some more thought to the issue, I realize that he has no reason to accept any word that I say. Why should he? And indeed, there is no scientific school in 1879 – Maxwell’s death date – that can support the idea of X-rays. And once again, I find that I cannot fault him for disbelieving my claims. According to all the scientific knowledge from the 19th century, energy cannot come from nowhere. Maxwell, for all his genius, does not believe me, and could not have forecast these advancements when he was alive. Indeed, no logical forecasters from the 19th century would have made these predictions about the future, since they suffered from the Failure of the Paradigm. A paradigm, according to Wikipedia, is “a distinct set of concepts or thought patterns”. In this definition one could include theories and even research methods. More to the point, a paradigm describes what can and cannot happen. It sets the boundaries of belief for us, and any forecast that falls outside of these boundaries requires the forecaster to come up with extremely strong evidence to justify it. Up to our modern times and the advent of science, paradigms changed in a snail-like pace. People in the medieval times largely figured that their children would live and die the same way as they themselves did, as would their grandchildren and grand-grandchildren, up to the day of rapture. But then Science came, with thousands of scientists researching the movement of the planets, the workings of the human body – and the connections between the two. And as they uncovered the mysteries of the universe and the laws that govern our bodies, our planets and our minds, paradigms began to change, and the impossible became possible and plausible. Lord Rutherford – the “father of nuclear physics” in the beginning of the 20th century, often denigrated the idea that the energy existing in matter would be utilized by mankind, and yet one year after his death, the fission of the uranium nucleus was discovered. Today, our entire economy and life are based on electronics and on the power obtained from electric power plants – all of them based on Faraday’s innovations, and completely unexpected at his time. This paradigm shift has happened just nine years ago. It was believed that biological cells, once they mature, can never ‘go back’ and become young again. Shinya Yamanaka other researchers have turned that belief on its head in 2006, by genetically engineering mature human cells back into youth, turning them into stem cells. That discovery has earned Yamanaka his 2012 Nobel prize. 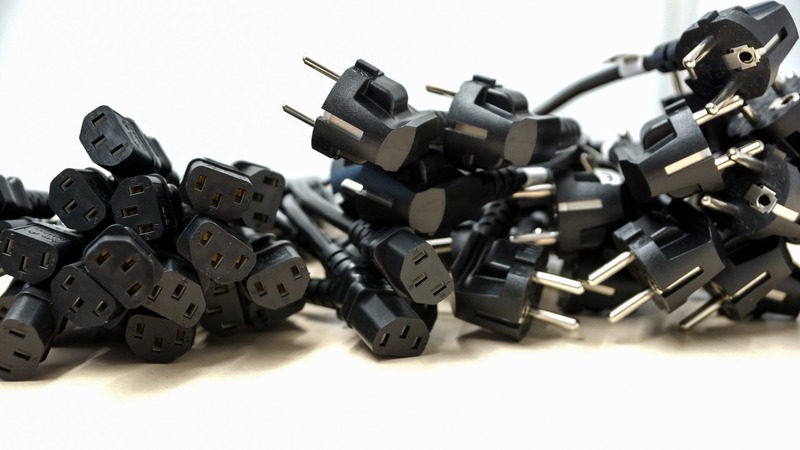 Plugs everywhere. You can blame Maxwell and Faraday for this one. 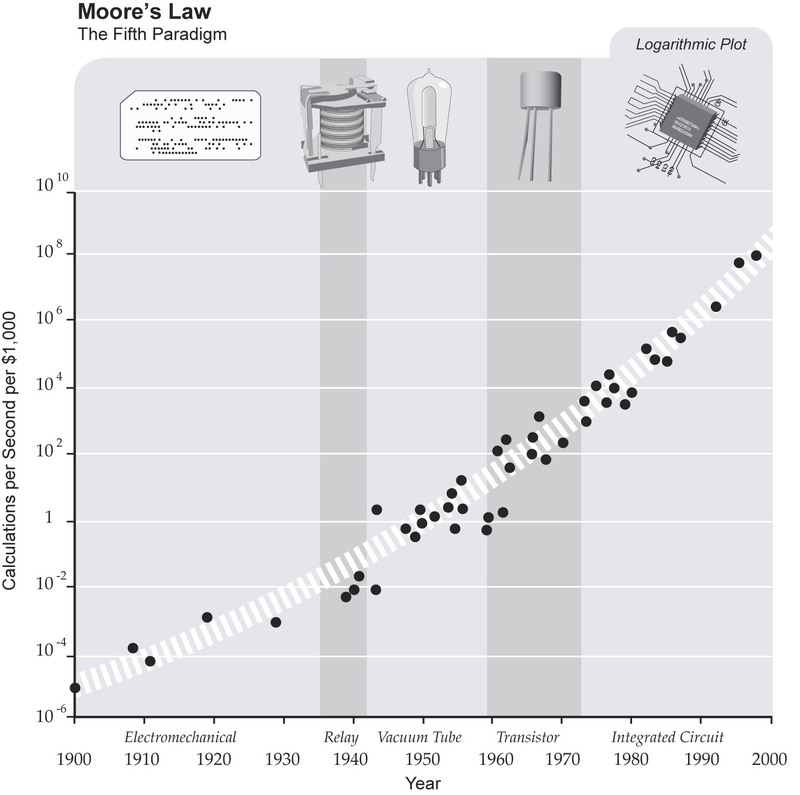 It is most illuminating to see how computers have advanced throughout the 20th century, and have constantly shifted from one paradigm to the other along the years. From 1900 to the 1930s, computers were electromechanical in nature: slow and cumbersome constructs with electric switches. As technology progressed and new scientific discoveries were made, computers progressed to using electric relay technology, and then to vacuum tubes. One of the first and best known computers based on vacuum tubes technology is the ENIAC (Electronic Numerical Integrator and Computer), which weighed 30 tons and used 200 kilowatts of electricity. It could perform 5,000 calculations a second – a task which every smartphone today exceeds without breaking a sweat… since the smartphones are based on new paradigms of transistors and integrated circuits. And indeed, one cannot build a smartphone with vacuum tubes. The entire computing paradigm needed to change in order for this new technology to appear on the world’s stage. What does the Failure of the Paradigm mean? Essentially what it means is that we cannot reliably forecast a future that is distant enough for a paradigm shift to occur. Once the paradigm changes, all previous limitations and boundaries are absolved, and what happens next is up to grabs. This insight may sound gloomy, since it makes clear that reliable forecasts are impossible to make a decade or two into the future. And yet, now that we understand our limitations we can consider ways to circumvent them. The solutions I’ll propose for the Failure of the Paradigm are not as comforting as the mythical idea that we can know the future, but if you want to be better prepared for the next paradigm, you should consider employing them. 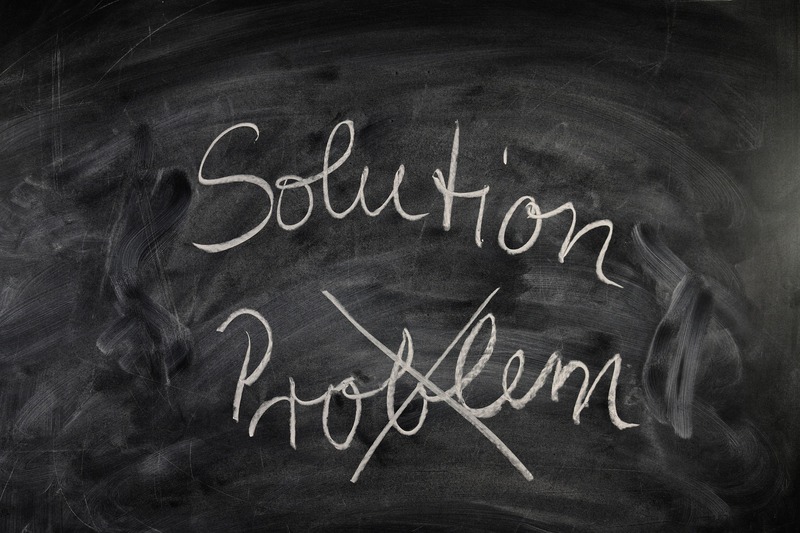 And now – for the solutions! The first solution is quite simple: invent the new paradigm yourself, and thus be the one standing on top when the new paradigm takes hold. The only problem is, nobody is quite certain what the next paradigm is going to be. This is the reason why we see the industry giants of today – Google, Facebook, and others – buying companies left-and-right. They’re purchasing drone companies, robotics companies, A.I. companies, and any other idea that looks as if it has a chance to grow into a new and successful paradigm a decade from now. They’re spreading and diversifying their investments, since if even one of these investments leads into the new paradigm, they will be the Big Winners. Of course, this solution can only work for you if you’re an industry giant, with enough money to spare on many futile directions. If you’re a smaller company, you might consider the second solution instead. The famous entrepreneur Peter Diamandis often encourages executives to invite small teams of millennials into their factories and companies, and asking them to actively come up with ideas to disrupt the current workings of the company. The millennials – people between 20 to 30 years old – are less bound by ancient paradigms than the people currently working in most companies. Instead, they are living the new paradigms of social media, internet everywhere, constant surveillance and loss of privacy, etc. They can utilize and deploy the new paradigms rapidly, in a way that makes the old paradigms seem antique and useless. This solution, then, helps executives circumvent the Failure of the Paradigm by adapting to new paradigms as quickly as possible. One of the rules for effective Forecasting, as noted futurist Paul Saffo wrote in Harvard Business Review in 2007, is to forecast often. The proficient forecaster needs to be constantly on the alert for new discoveries and breakthroughs in science and technology – and be prepared to suggest new forecasts accordingly. The reason behind this rule is that new paradigms rarely (if ever) appear out of the blue. There are always telltale signs, which are called Weak Signals in foresight slang. Such weak signals can be uncovered by searching for new patents, reading Scientific American, Science and Nature to find out about new discoveries, and generally browsing through the New York Times every morning. By so doing, one can be certain to have better hunch about the oncoming of a new paradigm. You knew that one was coming, didn’t you? And for a good reason, too. Many science fiction novels are based on some kind of a paradigm shift occurring, that forces the world to adapt to it. Sometimes it’s the creation of the World Wide Web (which William Gibson speculated about in his science fiction works), or rockets being sent to the moon (As was the case in Jules Verne’s book – “From the Earth to the Moon”), or even dealing with cloning, genetic engineering and bringing back extinct species, as in Michael Crichton’s Jurassic Park. Science fiction writers consider the possible paradigm shifts and analyze their consequences and implications for the world. Gibson and other science fiction writers understood that if the World Wide Web will be created, then we’ll have to deal with cyber-hackers, with cloud computing, and with mass-democratization of information. In short, they forecast the implications of the new paradigm shift. Science fiction does not provide us with a solid forecast for the future, then, but it helps us open our minds and escape the Failure of the Paradigm by considering many potential new paradigms at the same time. While there is no research to support this claim, I truly believe that avid science fiction readers are better prepared for new paradigms than everyone else, as they’ve already lived those new paradigms in their minds. When trying to look far into the future, don’t focus on the obstacles of the present paradigm. Rather if you constantly see that similar obstacles have been overcome in the past (as happened with computers), there is a good reason to assume that the current obstacles will be defeated as well, and a new paradigm will shine through. Therefore, you have to believe that mankind will keep on finding solutions and developing new paradigms. The forecaster is forced, in short, to become a believer. Obviously, this is one of the toughest solutions to implement for us as rational human beings. It also requires us to look carefully at each technological field in order to understand the nature of the obstacles, and how long will it take (according to the trends from the past) to come up with a new paradigm to overcome them. Once the forecaster identifies these parameters, he can be more secure in his belief that new paradigms will be discovered and established. The Failure of the Paradigm is a daunting one, since it means we can never forecast the future as reliably as we would like to. Nonetheless, business people today can employ the above solutions to be better prepared for the next paradigm, whatever it turns out to be. Of all the proposed solutions to the Failure of the Paradigm, I like the fourth one the best: read science fiction. It’s a cheap solution that also brings much enjoyment to one’s life. In fact, when I consult for industrial firms, I often hire science fiction writers to write stories about the possible future of the company in light of a few potential paradigms. The resulting stories are read avidly by many of the employees in the company, and in many cases show the executives just how unprepared they are for these new paradigms. A few days ago I decided that I wanted a new business card for the up and coming new year. I headed straight to Fiverr, and browsed through some of the graphic designers who offered their services for five dollars or more. After a few minutes, my choice was made: I decided to use the designer with more than a hundred of 5-star positive ratings, and literally no negative reviews at all. Of course, the gig didn’t really cost five dollars. I added $10 to receive the source file as well, $5 for the design of a double-sided business card, and $5 for a “more professional work”, as the designer put it. Along with other bits, the gig cost $30 altogether, which is still a good price to pay for a well-designed card. I received the design in 24 hours. It was, simply put, nowhere near what I expected. The fonts were all wrong, the colors were messed up, and worst of all – the key graphical element in front of the card was not centralized properly, which indicates to me a lack of attention to details that is outright unprofessional. So I asked for a modification, which was implemented within a day. It was not much better than the original. At which point I thanked the designer, and concluded the gig with a review of her work. I gave her a rating of generally three stars – possibly more than I felt that her skills warrant, and wrote a review applauding her effort to fix things, but also mentioned that I was not satisfied with the final result. An hour later, the designer sent me a special plea. She asked me, practically in virtual tears, to remove my review, telling me that we can cancel the order and go to our separate ways. She told me that her livelihood depends on Fiverr, and without high ratings, she would not be approached by other buyers in the future. 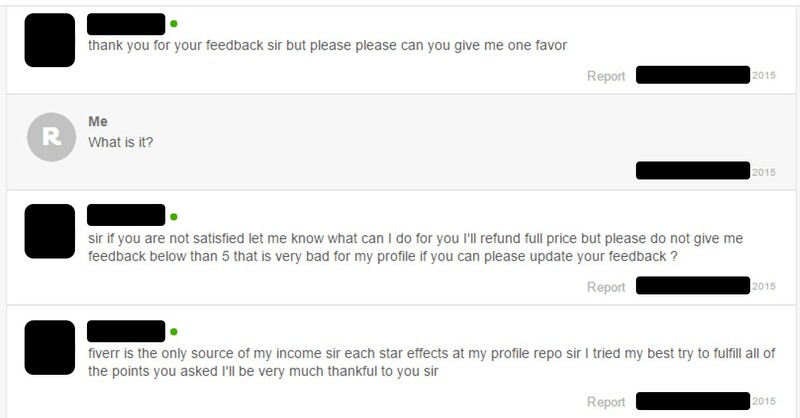 I knew that my money would not actually be returned to me, since Fiverr only deposits the return in your Fiverr account for the next gigs you will purchase from them.But seeing a maiden so distraught, and me having an admittedly soft heart, I decided to play the gallant knight and deleted my negative review. And so, I betrayed the community, and added to the myth of Fiverr. In December 2011, the management guru Gary Hamel published an intriguing piece in the Harvard Business Review called “First, Let’s Fire All the Managers”. In the article, Hamel described a wildly successful company – The Morning Star Company – based on a model that makes managers unnecessary. The workers regulate themselves, criticize each other’s work, and deliberate together on the course of action their department should take. Simply put, everyone is a manager in Morning Star, and no one is. The Morning Star company – a workplace without managers. Morning Star is a shining example for a no-managers workplace which actually works in a competitive market, since each person in the firm makes sure that others are doing their jobs properly. But what happens in Fiverr? I have no idea how many service providers on Fiverr beg their customers for high ratings. I have a feeling that it happens much more frequently than it should, and that soft-hearted customers like me (and probably you too) can become at least somewhat swayed by such passionate requests. The result is that some service providers on Fiverr will enjoy a much higher rating than they deserve – which will in effect deceive all their future potential customers. Fiverr could easily take care of this issue, by banning such requests for high rating, and setting an algorithm that screens all the messages between the client and the service provider to identify such requests. But why should Fiverr do that? Fiverr profits from having the seemingly best designers on the web, with an average of a five stars rating! Moreover, even in cases where the customer is extremely ticked off, all that will happen is that the service provider won’t get paid. Fiverr keeps the actual money, and only provides recompensation by virtual currency that stays in the Fiverr system. This is a system, in short, in which nobody is happy, except for Fiverr: the customer loses money and time, and the service provider loses money occasionally and gets no incentive or real feedback that will make him or her improve in the long run. As I wrote earlier, Fiverr could easily handle this issue. Since they do not, I rather suspect they like the way things work right now. However, I believe that sooner or later they will find out that they have garnered themselves a bad reputation, which will keep future customers away from their site. We know that great start-ups that have received a large amount of funding and hype, like Quirky, have toppled before because of inherent problems in their structures. I hope Fiverr would not fail in a similar fashion, simply because it doesn’t bother to winnow the bad apples from its orchard.